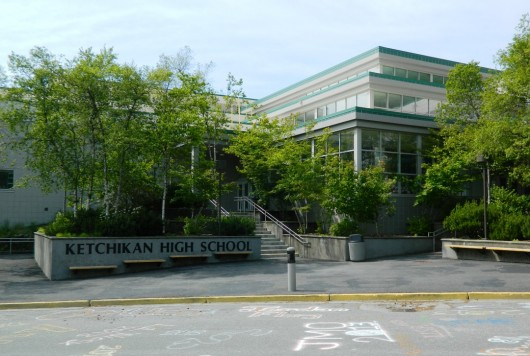 The Ketchikan School Board adopted new administrative regulations last week governing student nutrition and physical activity, in order to meet new federal standards. Those last two areas raised some concerns, and led to a couple of language changes in order to relax the rules a little. One of the issues was selling food at athletic competitions that take place during the school day, such as the recent regional basketball tournament. Many non-students attend those activities, and, as Board Member Stephen Bradford pointed out, want their snacks during a game. That amendment passed unanimously, as did Bradford’s second suggestion, which provides an exception to the healthy food standards for special occasions. “So the amendment would be, ‘Traditional or cultural foods may be exempted from the food standards described above for educational or special school or classroom events when offered free of charge,’” Board President Michelle O’Brien summed up. Student board member Evan Wick suggested a third amendment to the guidelines. He noted that the rules prohibit any kind of educational material or school display that includes a name-brand of an unhealthy food. “I’ve brought with me some educational materials. This is my AP world history book. It has a picture of McDonald’s in it. That would fall under the brands or illustrations of unhealthful foods,” he said. Wick then handed around a detail from a mural that covers a wall in the high school’s commons area. “It features a Burger King soda, fries and what appears to be a cheeseburger, which I do believe probably falls under unhealthful foods,” he said. As the student representative, Wick isn’t allowed to make motions, but he asked the School Board to consider amending the regulation, adding the words “within reason.” Board Member Trevor Shaw complied, and the amendment passed unanimously. The main motion also passed without dissent. Approving it means that the district’s policies now are aligned with the 2010 federal Healthy, Hunger-Free Kids Act.